As a fan of quotes, I’ve pieced together several to create the following compilation video (with random training footage in the background). Damn man. That was just awesome–inspiring to the highest degree. You’ve put up awesome videos with great stories. I’ve seen it from the best in their fields: Erwan Le Corre, Damian Walters, David Belle, Greg Plitt and Pavel Tsatsouline. But this, Ross Enamait, has got to be a testament to knowing your situation, understanding your approach towards anything and meditating over everything while in the process–all related of how pure the intention and how hard you work in order to attain it. Renewal of passion will commence now. I like it, good stuff. Agree with what Kyle said: Renewal of passion will commence now. Beyond awesome and totally inspirational too, as an example of a man who talks the talk and walks the walk your at the pinnacle! 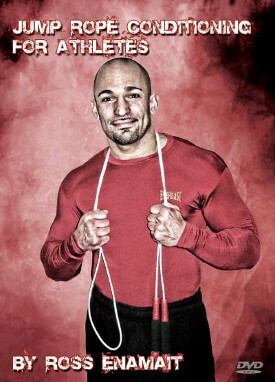 Awesome man, you’re ahead of your time using the “Old” true way of training! Whoa — handstand push ups on a suspension trainer! That is fantastic. Ross, please send me a message and tell me what song that was. I would be absolutely grateful, it is an awesome trailer song! Wow man, is that 150 kilo that you are benching 5 times? that is ridiculous, I bet you could total elite in powerlifting without training for it. Respect! @Frank – the song info is in the Youtube description. The track name is Towers of Terror. Thank you for sharing this video with us. Ross lives a congruous strength and conditioning lifestyle. What else is there to say? Great, great stuff here. Amazing Ross! This has to be the best one yet. I do think you are crazy benching all that when you are alone. Great quotes!! Great inspirational training clips!! Great ALL-AROUND fitness!! Great Video how say in the comments: Totally awesome and inspiring! I like to know how much time you training per day? Great quotes but the real feats are just awesome. You are true inspiration and way ahead of most so called “gym beasts”. Tu es un boss Mr Emanait !! king of sport ! Un exemple !! merci pour cette video ! thanks very mush for exemple exercices ! Que dieu te protÃ¨ge !! I remember years ago reading about some guy who had laid claim to being the World’s Fittest Man in one of those magazines like Men’s Health or it might have been Men’s Health. Anyhow this guy went through a 24-hour ordeal of running, calisthenics, weightlifting, swimming, rowing on a rowing machine, and bicycling, and maybe more events, can’t quite remember it all. I do remember what he did was staggering just to think about it, and probably like doing a triathlon and hitting the gym for an intense session of weights and cardio afterwards. Guys like this guy and Ross surely show what the human body and MIND is capable of performing with the proper training, mindset/focus/will, and nutrition. Getting ready for my Saturday workout which is USUALLY always the hardest one and quite honestly the one I skip the most. Just watched Ross’s vid again for motivation. This is a great video to view right before your training. The man you are referring to is Joe Decker. He runs his out fitness business out of California I believe. Gut Check Fitness. He helped me prepare for the Spartan Death Race, nicest guy you could ever talk to. No it’s not Joe Decker, but I googled him up and I see he’s laying claim to that title of “The World’s Fittest Man.” This guy was from the late Nineties or early 00’s and he did maybe the same 24 hour challenge as Decker. I just remember the guy did something like Mountain biking, then swimming, then lifting some many pounds a weights in a given time period, along with performing so many pushups, situps or crunches, jumping jacks, rowing X-amount of meters on a Concept II rowing machine, running so many miles, and biking X-amount of miles all in 24 hours. Don’t know if that’s the same 24-hour challenge as Decker did, or if this kind of thing has been done yearly like the Ironman Triathlon and has had different so-called title holders. Just googled up some of the so-called fitness challenges and they are similar but there is certainly not one uniform 24 hour challenge to determine the fittest man. Some of those challenges were finished in under 24 hours by a good margin. Guinness Book Record holder Paddy Doyle had the record in one particular challenge where he did multiple events like so many pounds of lifting weights, 2 mile swim, rowing 20 miles on a rowing machine, etc. I think he completed his challenge in well under 24 hours, if I remember right it took about 18 hours and some change. I try to stay in shape all year round. Biggest obstacle is strains and recovery time . How do you manage to do all this work daily ? any advice for soreness, injuries? how can one train daily yet recover ? @Louay – There isn’t a short answer to the question. I’ve been training for over 20+ years consistently. Work capacity builds up gradually over the years. I can handle more work now than I could many years ago. What made sense for me then wouldn’t make sense for me now (and vice versa). I know my body very well and know when to back off (and when I can really go for broke). Intensity varies from day to day based on how I feel. This site has to be one of the most motivational, not only for the videos featuring you but also the ones which you seem to have a knack for finding. Awesome, plain and simple. Everytime I visit I leave fired up to get at it. Ross, can you please post a list with the quotes from the clip? Heavy DB Walking lunges with a vest … SWEET! Suspension hand stand push ups ….. CRAZY! Pull ups with lots of 45lb plates …. BEASTLY! The inspiration from these exercises/quotes … PRICELESS! Wow, really impressive video man! Great quotes too. You are an inspiration to me and I believe to everyone who watches this video. You give a new meaning to one of my favorite expressions: “There are no ordinary moments”. You live every second as a Warrior. Thank you for inspiring me even further with my training. You got to come out with a detailed program on how us mortals can fit in all those different training exercises into a training program. Don’t know how you can cram all those different methods of training into one program. Sand bags, weights, boxing, bodyweight, sledgehammers, tires, furniture sliders, isometrics, etc. One thing I’ve noticed is you haven’t jumped on the kettlebell bandwagon. Hey Ross, you are an inspiration always!!! You are such an inspiration and never disappoint us!